Since the escalation of US trade protectionism this year, increasingly centered on China, a US-Sino trade friction is a lose-lose proposition for the world economy, especially for Asia, home to some of the most open economies in the world. Nonetheless, multinational companies (MNCs) are nimble, and at a more granular level, there are likely to be some companies, industries and possibly even small economies that could benefit from this. We identify two channels of potential benefit from this trade friction: import substitution (in the short run) and production relocation (in the medium term). To explore the potential for trade substitution by China and the US towards the rest of Asia, we utilize the announced official tariff lists by both sides at HS 8-digit commodity codes and map the US and China lists of 7,705 products to the value of these products in the exports of 12 other Asian countries. In the short term, if the US and China charge higher tariffs on each other’s imports, companies will have an incentive to replace these expensive imports with local production sources or substitute from other countries. With the use of the Nomura Import Substitution Index (NISI), we assess the extent to which Asian countries, and specific sectors within them, could benefit from China and US import substitution. From the index, it appears that Malaysia, Japan, Pakistan, and the Philippines are the biggest beneficiaries. Meanwhile, a prolonged US-Sino trade conflict, in the medium term, would encourage MNCs to start diverting some of their production to factories in other countries to escape tariffs, or even relocating whole plants if the trade friction sustains. 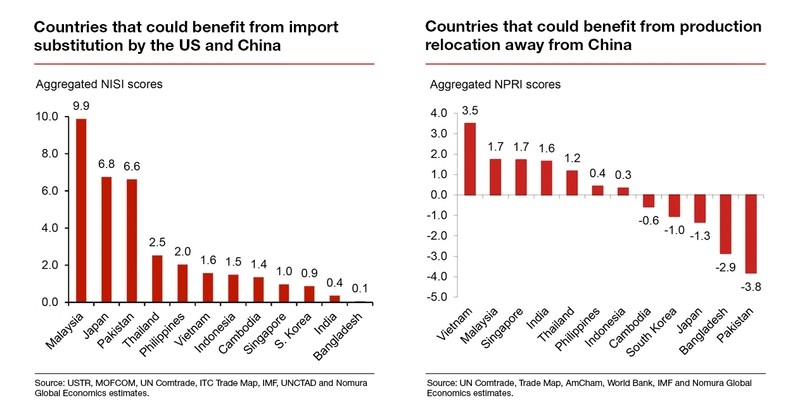 To estimate potential beneficiaries of production relocation, we use the Nomura Production Relocation Index (NPRI) utilizing three parameters: 1) an export similarity index to measure the extent of overlap in countries’ export structures vis-a-vis China; 2) qualitative surveys of MNCs; and 3) Nomura’s scorecard of foreign direct investment (FDI) attractiveness. If companies were to divert production and FDI from China, the index estimates that Vietnam would be a clear winner, followed by Malaysia, Singapore and India. Unlike with import substitution, Pakistan benefits the least from the diversion of production and FDI. Some limitations of this analysis include the changing of relative price and exchange rate effects mitigating the extent of substitution effects. Additionally, Asian economies indirectly face large negative effects because they are large suppliers of parts and components to China. To provide investors with a practical way to express an investment view on the Asian trade beneficiary theme, there is a list of stocks that have exposure to the countries and product categories identified in this report as relative potential winners. These relative winners are concentrated in Malaysia and Japan. Read our full report here for specific products and companies that are likely to benefit in each country. What can we learn from the history of trade wars?